The quadrant is extremely elegant and elaborate. The circular arc is highly ornamental and decorated with curls and arabesque patterning, with three graduations marked by the letters 'A' (0 to 6), 'L' (0 to 48), 'G' (0 to 90?). At the centre of one of the flourishes is the monogram 'A. D.', which may refer to the instrument maker, who has yet to be identified. 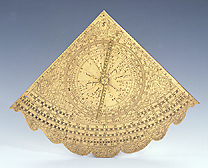 The front of the quadrant bears a circle with three graduations for the zodiacal calendar, the names of the constellations and the pointer. The back bears the declinations of many stars and some markings relating to time-calculation. A motto on the side recording the flight of time and the imminence of death is signed 'T.R. '.